Speed to training is a top priority for the food service industry facing high-turnover and shifting menus, therefore the key to Food Service Industry e-Learning: Simplify, Simplify, Simplify. Keep training content lean and basic, lending itself to quick and easy updates. There’s little doubt that online training, especially with today’s mobile devices, is the fastest way to train employees, but what is the fastest way to create your online content? Things like new restaurant openings, specials, limited time offers, and new menu rollouts require instant employee access. By the time training is built, things have already changed. Dupont Learning has been developing custom online training content for companies for about 15 years. Our experience has brought us to the conclusion that for some industries, particularly food service, you need to keep it simple! Unlike other industries, changes occur too fast to edit, update voice-over, republish, and overwrite the old for the new quickly and inexpensively, while allowing employees real-time access to the current information they need to best serve customers. Current technologies have enabled us to design a flexible training model to meet these challenges. Your content will appear in a course iFrame – which will be populated from content (.pdf) that you upload to the server via an ftp client application like FileZilla. Changes to the content are achieved by uploading an updated document, overwriting the old content. Update will then populate automatically in the e-learning course. The certification test will be created via an excel template – which can be installed directly into the course without creating the individual questions in the authoring tool. Note that this is a little more work than simply overwriting a test Excel doc, but the work involved is just minutes, not hours. Test score is recorded on client’s LMS, or Dupont Learning’s LMS solution, with customer branding. 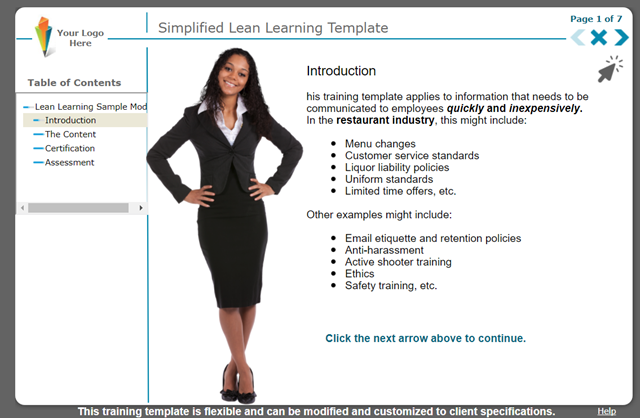 Click HERE to register and view a sample of our “Simplified Lean Learning” template.